Expect beautiful 4K clarity on the 27” Dell Ultra HD monitor with four times the resolution of Full HD, wide color coverage and reliable performance. Connect to laptops, tablets and other devices without compromising on picture quality. The high pixel density helps you see extremely fine details onscreen so you can view and edit higher resolution photos and more. Ultra HD 3840 x 2160 resolution: Over 8 million pixels with four times the resolution of Full HD, plus wide color coverage at 99% sRGB Delta E.
Ultra-wide viewing angle at 178/178 degree, so each hue remains consistent from virtually any viewpoint. DisplayPort 1.2, you can daisy-chain two monitors side by side by connecting via the DP-in and DP-out ports, eliminating the need to link every one of your monitors to the PC and reducing cable clutter. Included stand enables tilt (5 degrees forward or 21 degrees backward), pivot, swivel and even provides built-in cable-management. 14.9" x 25.2" x 2"
Dell 27 Ultra HD 4K Monitor P2715Q: Your vision in extraordinary detail. Expect beautiful 4K clarity on the 68.47 cm (27") DellTM Ultra HD monitor with four times the resolution of Full HD, wide colour coverage and reliable performance. Ultra HD 3840 x 2160 resolution: Over 8 million pixels with four times the resolution of Full HD, plus wide colour coverage at 99% sRGB (deltaE <3). Reliable performance: Premium Panel Guarantee and minimal downtime with 3 years Advanced Exchange Service. The Dell 27 Ultra HD 4K Monitor – P2715Q is 68.47 cm (27") of gorgeous 3840 x 2160 resolution. That’s over 8 million pixels – with four times more detail than Full HD resolution. The high pixel density helps you see extremely fine details onscreen so you can view and edit higher resolution photos and more. Create your masterpiece with more clarity and colour enhancement – all at a price you can afford. You can count on natural and consistent colour across different mediums because each monitor is factory tuned at 99% sRGB with a colour calibration factory report certifying that each monitor has a deltaE < 3. That means you get precise colour coverage right out of the box at an amazing high-colour depth of 1.07 billion colours. Each hue remains consistent from virtually any viewpoint with an ultra-wide viewing angle at 178°/ 178°. 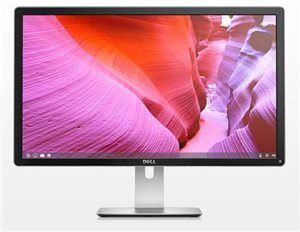 Dell P2715Q - LED monitor - 27"